We’ve had a great bumper crop of tomato’s this year, so I pulled this recipe out of my files. We’ve made it every summer for a number of years now and it’s always a treat. Heat large Dutch oven or heavy bottomed saucepan over medium heat. Add 3 tablespoons of the olive oil, the onion, and carrot and season with a pinch of salt and red pepper flakes. 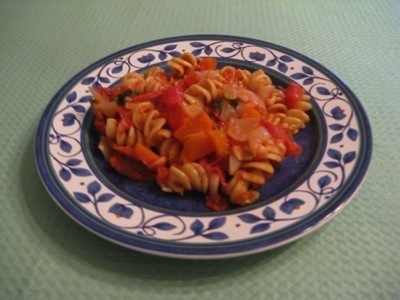 Cover and gently cook, stirring occasionally, until the vegetables are tender, about 10 minutes. Add the garlic and cook for 1 minute, then add the tomatoes and stir to combine. Cover again and cook, stirring occasionally, until the tomatoes are very juicy, 10-15 minutes. Uncover and continue to cook over medium heat, stirring occasionally for 30 minutes. Add the basil and cook 5 minutes more. Stir in remaining Olive Oil. Taste and adjust seasoning with salt and pepper if necessary. If it’s too acidic, you can add a pinch of rapadura, if it’s too sweet a drop of red wine vinegar. If you would like a thicker sauce cook down until it reaches the desired consistency. Serve over any type of pasta – we use organic whole wheat or organic rice pasta – and enjoy!